Flexor tendons in the hand are commonly injured, leading to impaired hand function. However, the scar-tissue healing response is not well characterized. A murine model of flexor tendon healing is demonstrated here. This model can enhance overall understanding of the healing process and assess therapeutic approaches to improve healing. Ackerman, J. E., Loiselle, A. E. Murine Flexor Tendon Injury and Repair Surgery. J. Vis. Exp. (115), e54433, doi:10.3791/54433 (2016). 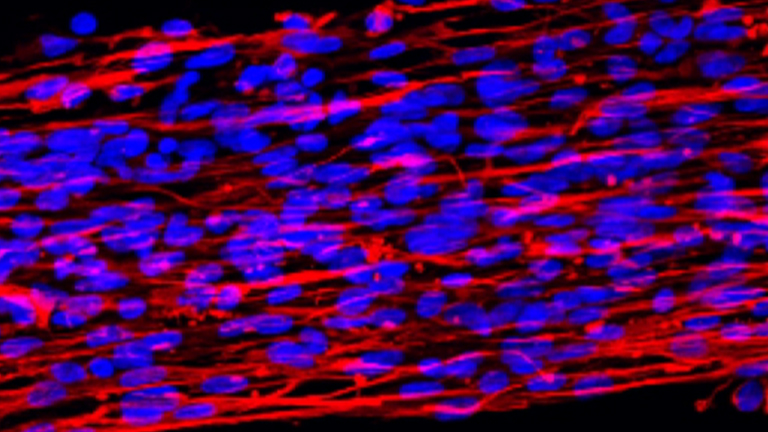 Tendon connects skeletal muscle and bone, facilitating movement of nearly the entire body. In the hand, flexor tendons (FTs) enable flexion of the fingers and general hand function. Injuries to the FTs are common, and satisfactory healing is often impaired due to excess scar tissue and adhesions between the tendon and surrounding tissue. However, little is known about the molecular and cellular components of FT repair. To that end, a murine model of FT repair that recapitulates many aspects of healing in humans, including impaired range of motion and decreased mechanical properties, has been developed and previously described. Here an in-depth demonstration of this surgical procedure is provided, involving transection and subsequent repair of the flexor digitorum longus (FDL) tendon in the murine hind paw. This technique can be used to conduct lineage analysis of different cell types, assess the effects of gene gain or loss-of-function, and to test the efficacy of pharmacological interventions in the healing process. However, there are two primary limitations to this model: i) the FDL tendon in the mid-portion of the murine hind paw, where the transection and repair occur, is not surrounded by a synovial sheath. Therefore this model does not account for the potential contribution of the sheath to the scar formation process. ii) To protect the integrity of the repair site, the FT is released at the myotendinous junction, decreasing the mechanical forces of the tendon, likely contributing to increased scar formation. Isolation of sufficient cells from the granulation tissue of the FT during the healing process for flow cytometric analysis has proved challenging; cytology centrifugation to concentrate these cells is an alternate method used, and allows for generation of cell preparations on which immunofluorescent labeling can be performed. With this method, quantification of cells or proteins of interest during FT healing becomes possible. Flexor tendons in the hand work in concert with the flexor muscles of the forearm and digital sheaths to enable flexion of the digits and grasping function of the hand. Flexor tendons run along the palmar aspect of the hand; this relatively superficial location often results in injuries to the flexor tendons during trauma to the hand. Tendons heal through a scar tissue response rather than regeneration of normal tendon tissue 1. While this scar tissue provides continuity to the tendon, function is dramatically decreased relative to healthy tendon. Tendon-scar tissue composites are characterized by impaired mechanical properties 1, rendering the repaired tendons more likely to rupture. In addition, scar tissue lacks the organization of the native tendon collagen fiber structure, resulting in an increase in tendon size and bulk. Given the anatomic constraints of the tendon-sheath unit, even a modest increase in tendon size can drastically reduce the gliding function of the tendon, and therefore digit range of motion and hand function. Prior to the 1960's injuries to the flexor tendons, particularly those in Zone II of the hand, were not routinely repaired due to the severe complications in healing that arose with these repairs 2. This area of the hand was referred to as 'no man's land' 3. However, improvements in surgical techniques, suture patterns and physical therapy rehabilitation protocols have dramatically improved outcomes of flexor tendon repairs 2. Despite these advances, up to 40% of repairs result in sufficient adhesion formation to impede hand function 4. Therefore, a biological approach is required to improve healing. Unfortunately, very little is known about the tendon healing process at the cellular and molecular level. Thus, the goal was to develop a murine model that could be used to improve the fundamental understanding of the cellular and molecular components of flexor tendon healing and the scar formation response, as a means to identify novel therapeutic targets to improve healing. Larger animal models have been instrumental in furthering understanding of the flexor tendon healing process. Canine and rabbit studies have demonstrated both the intrinsic and extrinsic healing ability of flexor tendons 5,6, the importance of early controlled passive motion in minimizing adhesion formation relative to immobilization 7, as well as the effects of different suture patterns on the healing process 8,9. In addition, the canine model has been useful in testing translational tissue-engineering approaches to improve healing 10. However, there are several important advantages in using a murine model relative to a large animal model, including the relative cost, availability of murine specific reagents, and the ease of generating global knock-outs or tissue-specific deletion/overexpression constructs. Moreover, the functional similarities between human and mice with respect to flexor tendons 11 indicate the potential utility in developing a murine model. 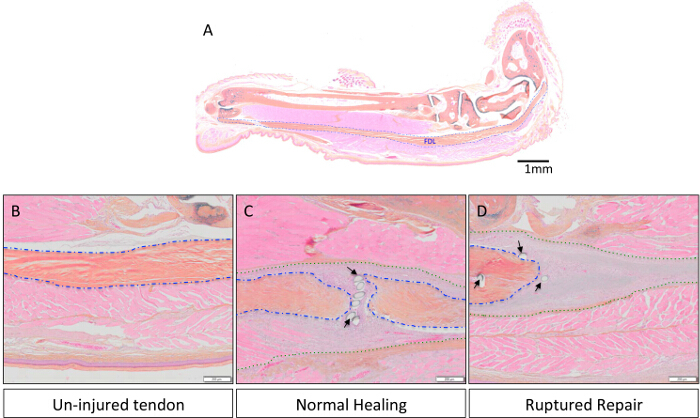 Development of a murine model of flexor tendon transection and repair mimics many aspects of clinical healing, including the formation of abundant scar tissue and impaired mechanical properties. The model described here is not a true recapitulation of clinical practice due to transection of the FDL at the myotendinous junction in order to protect the repair site. Furthermore, this model does not account for the contribution of synovial sheath cells to the healing response, as there is no synovial sheath covering the mid-portion of the tendon where the repair occurs. Despite these limitations, this model has the advantage of generating range of motion-limiting adhesions, which has yet to be demonstrated in murine models that more closely approximate the clinical scenario. This model has been used to assess knock-out mouse models 12,13, and to test different pharmacological approaches to improve healing 14-17. Histological analyses of this model, using immunohistochemistry and in situ hybridization, can provide important insights in to the localization of key genes and proteins during healing. However, histology provides only a cross-sectional spatial analysis and does not permit quantification throughout the entire tissue. Flow cytometry represents a more quantitative approach, but only a very limited number of cells can be isolated from the healing tendon tissue in the mouse model, and this number is further decreased during fixation, permeabilization, and washing steps. Taking this in to account, flow cytometry becomes an unfeasible approach due to the number of animals that would be required. An alternative method is necessary to preserve the majority of this small cell population in order to further characterize the healing milieu. The method used to accomplish this, shown here, involves concentration of the isolated cells via cytology centrifugation onto a glass slide, followed by immunocytochemistry. In the present study EdU (5-ethynyl-2'deoxyuridine, a thymidine analog) incorporation and subsequent labeling was used to determine the relative proliferative state of cells at the healing site. This approach can be applied to test the efficacy of pharmacological treatments on cell proliferation, gene knock-out or overexpression, or to identify and quantify different cell populations. The University Committee on Animal Research at the University of Rochester approved all animal experiments. Ten-12 week old female C57BL/6J mice were used. Autoclave surgical instruments to sterilize, wear sterile gloves throughout, and maintain a sterile operating field. Anesthetize the mouse via intraperitoneal injection (i.p.) with a volume of ketamine (80 mg/kg) and xylazine (10 mg/kg) corresponding to body weight. Confirm depth of sedation via absence of toe-pinch reflex. Administer pre-emptive analgesia (buprenorphine, 0.05-0.1 mg/kg) via subcutaneous injection. Apply ophthalmic ointment to prevent eyes from drying out. Prepare the surgical site by clipping the fur on the entire hind limb. Sterilize the skin by scrubbing sequentially with povidone iodine, followed by 70% ethanol, and again with povidone iodine. Find the flexor digitorum longus (FDL) tendon, seen superficially in the medial aspect of the calf. Using a scalpel, make a small 0.5-1 cm incision in the skin with micro-scissors to expose the tendon. Use forceps to separate the FDL tendon from surrounding tissue and trace it up to the myotendinous junction. Cut the tendon at this junction with spring scissors to release it, taking care to avoid the posterior tibial artery. Close the skin with 5-0 nylon sutures. Note: The FDL transection and repair (steps 2.4) should be performed using a stereomicroscope. Make a 3 mm incision over the posterolateral aspect of the hind paw using spring micro-scissors. Gently retract the surrounding soft tissue and muscle with forceps, making sure to minimize tissue damage, and identify the FDL tendon. Gently raise the FDL tendon and completely transect it using micro-scissors. Suture the ends of the FDL tendon together in a modified Kessler pattern with 8-0 sutures, avoiding drying of the tendon by periodically wetting it with saline. Replace soft tissue and muscle over the tendon, then close the incision with 5-0 nylon sutures. Place mice on a slide warmer set to 37 °C, to maintain body temperature until recovered from anesthesia. Monitor mice post-operatively for signs of impairment or infection including increased vocalizing and ruffled fur. Inject buprenorphine (50 µl/mouse) as analgesic every 12 hr until mice no longer show signs of pain or distress. Allow mice to heal for a period of 10 days post-surgery before continuing to the next steps. Note: Cells can be harvested at any time-point post-surgery. Here, 10 days are chosen for these representative experiments given the relatively high cellularity of the tissue at this time. Prepare EdU (5-ethynyl-2'deoxyuridine) solution (10 mg/ml in sterile Phosphate buffered saline [PBS] + 1% Dimethyl Sulfoxide [DMSO] to increase solubility). Inject mice with 100 µl EdU (50 mg/kg) via i.p. injection 24 hr prior to sacrifice. Prepare 3 mg/ml collagenase I in PBS. Euthanize mouse via carbon dioxide asphyxiation at a flow rate of no more than 3 L/min, and perform cervical dislocation as a secondary measure. Locate the repaired tendon using step 2.4 above, and isolate tendon tissue by cutting about 2 mm on either side of the injury site with micro-scissors. Mince tissue with scalpel in a petri dish with 1 ml of 3 mg/ml collagenase, then pass mixture through an 18 G needle several times to break up the tissue. Collect mixture into a 1.5 ml centrifuge tube. Digest tendon tissue for 1 hour at 37 °C with shaking. Spin tissue down (300 x g for 5 min), aspirate collagenase, then resuspend cells/tissue with 500 µl 3% bovine serum albumin (BSA) in PBS by pipetting up and down several times. Filter cell suspension through a 70 µm cell strainer to remove debris and large pieces of tendon, and set aside in a 37 °C incubator. Place tendon tissue into another 1.5 ml centrifuge tube, and refresh with 1 ml collagenase solution, pipetting up and down to mix. Incubate tissue another hour at 37 °C with shaking. Spin down digested tendon tissue (300 x g for 5 min), then resuspend in 500 µl 3% BSA in PBS by pipetting up and down several times. Filter cell suspension through a 70 µm cell strainer, combine with suspension isolated in 4.3.3, then count cells with a hemocytometer. Wash cells once more with 3% BSA in PBS, then resuspend to 3-6 x 104/100 µl. Attach a cytology funnel to a positively charged slide and lock into the slide carrier. Insert the entire apparatus into a cytology centrifuge and add 100 µl cell suspension to the funnel. Centrifuge at 300 x g for 5 min to disperse the cells on to the slide. Note: All incubation steps should be performed in the dark to limit photobleaching of fluorophores. Circle cells with a hydrophobic barrier pen to minimize solution needed for following steps, then immediately fix with 150 µl 3% paraformaldehyde in PBS 15 min at room temperature (RT). Wash twice for 5 min with 150 µl 3% BSA in PBS. Permeabilize cells with 0.5% Triton-X 100 in PBS 20 min at RT. Repeat wash step as in 5.1.1. Prepare EdU reaction cocktail according to kit instructions not more than 30 min before use. Add 150 µl cocktail to each slide, incubate 30 min at RT. Incubate with 150 µl nuclear counterstain Hoechst33342 diluted 1:2,000 in PBS 30 min at RT. Wash twice for 5 min with 150 µl 1x PBS. Add 1-2 drops anti-fade mounting medium to cells, then slowly lower coverslip to prevent bubbles. Allow mounting medium to cure overnight in the dark at RT. Use clear nail polish to seal the coverslip to the slide. Image slides at 40X magnification using a fluorescent microscope equipped with excitation/emission filters capable of detecting DAPI (Hoeschst33342), and Texas Red (Alexa Fluor 594). The flexor digitorum longus (FDL) muscle, located in the calf, acts to flex the digits of the mouse hind paw via the flexor tendon (outlined in blue in Figure 1A, and shown histologically in Figure 2A), which runs proximally from the myotendinous junction and terminates in the distal phalanges. In this model of flexor tendon healing, the FDL tendon is transected and repaired at the mid-foot, proximal to the bifurcation in to the digits of the hind paw (red arrows, Figure 1A). To prevent rupture of the repair, which would preclude experimental analysis, the tendon (and adjacent muscle) is cut, or released, at the myotendinous junction (yellow arrow in Figure 1B, release shown in Figure 1C). While this step is not representative of the clinical scenario, it is critical to protect the repair by decreasing strain on the injury site. Figure 2D is a histological example of a ruptured flexor tendon repair, compared to a successful repair shown in Figure 2C. In the latter, the granulation tissue displays greatly increased cellularity as compared to the uninjured tendon (Figure 2B), and this cell population can then be analyzed further via cytology centrifugation onto a slide followed by immunocytochemistry. 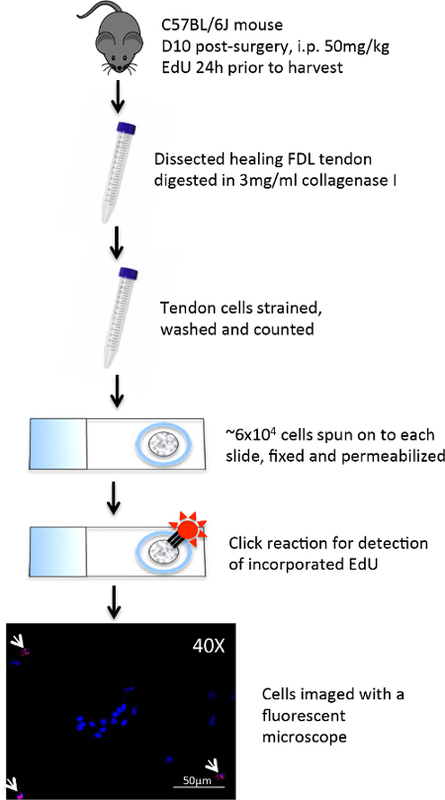 Figure 3 outlines the experimental procedure used to evaluate the proliferative state of the cells collected from healing tendons 10 days post-repair via EdU incorporation into newly synthesized DNA. EdU labeling therefore shows only those cells that actively proliferated during the 24 hr period following the EdU pulse in live mice, as seen in Figure 4. A quantitative assessment of proliferation in the granulation tissue of the healing tendon can then be determined by point-counting of the entire cell preparation. In this way, a baseline of proliferation can be established at each time point, and any changes due to genetic or pharmacological interventions may be assessed. Figure 1:. Murine Hind Paw Anatomy and Identification of the Flexor Digitorum Longus Tendon. The flexor digitorum longus (FDL) flexes the digits in the mouse hind paw and runs along the palmar aspect of the hind paw (FDL outlined in blue) where it bifurcates into the digits (red arrows) (Figure 1A). Proximally, the FDL tendon runs through the tarsal tunnel (black arrow), into the calf, ending at the myotendinous junction (yellow arrow) (Figure 1B). The release of the tendon at the myotendinous junction to prevent rupture is shown in Figure 1C. Please click here to view a larger version of this figure. Figure 2: Representative Histological Images of Un-injured, Normal Healing and Ruptured Flexor Tendon Repairs. The anatomy of the FDL tendon in the murine hind paw is shown in Figure 2A. Scale bar represents 1 mm. In Figures 2B-D, the tendon is magnified at 8X to compare uninjured tendon tissue (Figure 2B) to an intact and ruptured repair (Figures 2C & 2D, respectively). Whole hind paw samples were fixed in neutral buffered formalin, embedded in paraffin, cut in to 3 µm sections, and stained with Alcian Blue/Hematoxylin/Orange G as previously described 13. Native tendon is outlined in blue, tendon/granulation tissue composite is outlined in green, and black arrows indicate sutures. Scale bars represent 200 µm. Please click here to view a larger version of this figure. Figure 3: Experimental Procedure to Perform EdU Click-it Chemistry on Cell Preparations. On day 10 post-surgery healing FDL tendons were dissected from mouse hind paws. The tendons were minced then digested for two hours in collagenase I to dissociate the cells. The cell suspension was strained to remove debris, and ~6 x 104 cells were spun into a monolayer on positively charged glass slides using a cytology centrifuge. The cells were circled with a hydrophobic barrier pen and then fixed immediately with paraformaldehyde. After permeabilization with Triton X-100, the cells were treated with an EdU detection cocktail, and a click chemistry reaction bound Alexa Fluor 594 to incorporated EdU. Hoechst 33342 was used as a nuclear stain, and the cells were analyzed at 10-40X with a fluorescent microscope. Please click here to view a larger version of this figure. Figure 4: Immunocytochemistry Analysis of Cycling EdU-labeled Cells During Flexor Tendon Healing. Healing FDL tendons were harvested from the hind paws of mice 10 days post-surgery and digested with collagenase to obtain a cell suspension. Centrifugation was used to disperse these cells into a monolayer on slides, followed by immunocytochemistry to image EdU incorporation. Figure 4A and Figure 4B are images taken at 10X and 40X respectively of the cells following immunocytochemical analysis. Nuclear stain Hoechst 33342 is blue, and cells that have incorporated EdU are dotted with red. Scale bars represent 50 µm. Please click here to view a larger version of this figure. The surgical procedure for a murine model of complete transection and repair of the flexor digitorum longus tendon is presented in this study. In addition a novel application of concentrating small cell populations with cytology centrifuge is demonstrated, allowing for quantitative immunocytochemical analysis of the cellular environment during flexor tendon healing. This model of flexor tendon repair demonstrates a reproducible healing response, which can be used to assess changes in the healing process using knockout models or with pharmacological intervention. Following surgery, an inflammatory reaction begins within 24 hr, during which cells are recruited to the injury site and a callus of fibrous tissue begins to form. A proliferative phase follows at about day four, involving greatly increased cellularity and abundant deposition of disorganized extracellular matrix at the repair site, leading to adhesion formation between 14-21 days. Tissue remodeling continues through day 35, at which time continuity and organization of the flexor tendon is restored, and cellularity is reduced 18. Currently, there are several murine models of flexor tendon repair in addition to the one presented here. Tsubone et al., have described an in vitro model of flexor tendon healing 19. While this model can assess changes in gene expression over time, it cannot account for the recruitment of extrinsic cells or changes in the inflammatory/cytokine milieu that occurs in vivo. In vivo, two models of partial transection have been developed using either incisional or excisional defects 20,21. More recently, Wong et al., characterized a Zone II model of flexor tendon injury in a murine model 22. This is an important development, as it allows the contribution of synovial sheath-derived cells to the healing process to be defined. However, no quantifiable changes in gliding function have been described using this model. Each model has its own benefits and limitations that must be considered, including technical ease, clinical relevance and anatomy. A main limitation of the model described here is that the healing tendon may rupture prior to evaluation, rendering it unusable for further analysis. Harvesting sufficient cells is made unfeasible under these circumstances, and any histochemical analysis is not viable, as a ruptured tendon does not follow the standard healing process described above. Releasing the FDL tendon proximally to decrease strain on the healing tendon is therefore a critical step for prevention, despite the fact that it is not clinically relevant. Conducting the surgery unilaterally also lowers the rate of rupture. Another limitation is the inability to track the contribution of peri-tendinous sheath cells, as the synovial sheath does not surround the segment of FDL tendon that is injured in this model. An important function of this flexor tendon repair model is that it allows evaluation of the cells at the healing site. Immunofluorescence/immunohistochemistry (IHC) is a common biological technique that can be used to characterize these cells. While IHC is uniquely suited for determination of spatial information, it is largely a qualitative method. Changes in tissue or cell composition throughout the depth of the tissue can be missed, and quantification of populations is difficult. Flow cytometry represents an ideal approach to define, quantify and potentially isolate cell populations during healing. However, isolation and digestion of healing tendon tissue from this model yields very low cell numbers for flow cytometric analysis (1-2 x 105 on average from each mouse), and fixation/permeabilization steps for detection of intracellular markers reduces this number further. Using cytology centrifugation to concentrate the isolated cells, followed by immunocytochemistry, provides a way to characterize these small cell populations. A significant advantage of this technique is that there is no need to pool samples together to obtain enough cells; therefore each mouse represents an individual sample for analysis. An important consideration in generating these cell preparations is maintaining consistency in the tissue harvested for analysis. Surrounding muscle and fascia may adhere to the granulation tissue and must be carefully dissected away. Since this method involves minimal processing of the cells prior to fixation on slides, it retains a majority of isolated cells for further analysis. In this way, nearly the entire population of cells making up the adhesion tissue at the repair site can be quantitatively assessed via immunocytochemistry. In the present study, EdU incorporation by proliferating cells is used to demonstrate the application of this cytology technique, however, it can also be used for more complex and in-depth characterization of the heterogeneous cell populations involved in flexor tendon healing. Future applications of this technique may lead to more in depth characterization of the cell populations involved in tendon healing, as it allows for determining co-localization of cellular markers in the cells associated with the granulation tissue in healing tendon. This work was partially supported by the American Society for Surgery of the Hand Pilot Award and NIH/NIAMS 1K01AR068386-01 (to AEL) and NIAMS/NIH P30AR061307. Lin, T. Biomechanics of tendon inury and repair. J Biomech. 37, 865-877 (2004). Strickland, J. W. Development of flexor tendon surgery: twenty-five years of progress. J Hand Surg [Am]. 25, 214-235 (2000). Bunnell, S. Repair of tendons in the fingers and description of two new instruments. Surg Gynecol Obstet. 26, 103-110 (1918). Aydin, A., et al. Single-stage flexor tendoplasty in the treatment of flexor tendon injuries. Acta Orthop Traumatol Turc. 38, 54-59 (2004). Gelberman, R. H., Steinberg, D., Amiel, D., Akeson, W. Fibroblast chemotaxis after tendon repair. J Hand Surg Am. 16, 686-693 (1991). Lundborg, G., Rank, F. Experimental intrinsic healing of flexor tendons based upon synovial fluid nutrition. J Hand Surg Am. 3, 21-31 (1978). Aoki, M., Kubota, H., Pruitt, D. L., Manske, P. R. Biomechanical and histologic characteristics of canine flexor tendon repair using early postoperative mobilization. J Hand Surg Am. 22, 107-114 (1997). Kim, H. M., et al. Technical and biological modifications for enhanced flexor tendon repair. J Hand Surg Am. 35, 1031-1037 (2010). Aoki, M., Manske, P. R., Pruitt, D. L., Kubota, H., Larson, B. J. Work of flexion after flexor tendon repair according to the placement of sutures. Clin Orthop Relat Res. 205-210 (1995). Zhao, C., et al. Award for Outstanding Orthopaedic Research: Engineering flexor tendon repair with lubricant, cells, and cytokines in a canine model. Clin Orthop Relat Res. 472, 2569-2578 (2014). Wong, J., Bennett, W., Ferguson, M. W., McGrouther, D. A. Microscopic and histological examination of the mouse hindpaw digit and flexor tendon arrangement with 3D reconstruction. J Anat. 209, 533-545 (2006). Katzel, E. B., et al. Impact of Smad3 loss of function on scarring and adhesion formation during tendon healing. J. Orthop. Res. 29, 684-693 (2011). Loiselle, A. E., et al. Bone marrow-derived matrix metalloproteinase-9 is associated with fibrous adhesion formation after murine flexor tendon injury. PloS one. 7, e40602 (2012). Lee, D. J., et al. Parathyroid hormone 1-34 enhances extracellular matrix deposition and organization during flexor tendon repair. J Orthop Res. 33, 17-24 (2015). Geary, M. B., et al. Systemic EP4 Inhibition Increases Adhesion Formation in a Murine Model of Flexor Tendon Repair. PloS one. 10, e0136351 (2015). Loiselle, A. E., et al. Development of antisense oligonucleotide (ASO) technology against Tgf-beta signaling to prevent scarring during flexor tendon repair. J Orthop Res. 33, 859-866 (2015). Orner, C. A., Geary, M. B., Hammert, W. C., O'Keefe, R. J., Loiselle, A. E. Low-dose and short-duration Matrix Metalloproteinase 9 Inhibition does not affect adhesion formation during murine flexor tendon healing. Plast Reconstr Surg. (2016). Loiselle, A. E., et al. 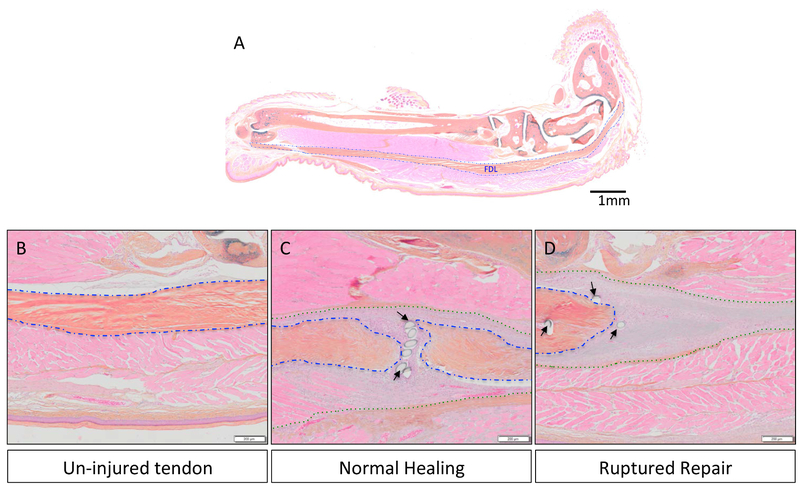 Remodeling of murine intrasynovial tendon adhesions following injury: MMP and neotendon gene expression. J Orthop Res. 27, 833-840 (2009). Tsubone, T., et al. Effect of TGF-beta inducible early gene deficiency on flexor tendon healing. J Orthop Res. 24, 569-575 (2006). Beason, D. P., Kuntz, A. F., Hsu, J. E., Miller, K. S., Soslowsky, L. J. Development and evaluation of multiple tendon injury models in the mouse. J Biomech. 45, 1550-1553 (2012). David, M. A., et al. Tendon repair is compromised in a high fat diet-induced mouse model of obesity and type 2 diabetes. PloS one. 9, e91234 (2014). Wong, J. K., et al. The cellular biology of flexor tendon adhesion formation: an old problem in a new paradigm. Am J Pathol. 175, 1938-1951 (2009).